Laura Bassett is a reluctant English football icon. She only sees her place in history as one of "heartbreak and heartache" after scoring the own goal that cost the Lionesses a spot in the Women's World Cup final. 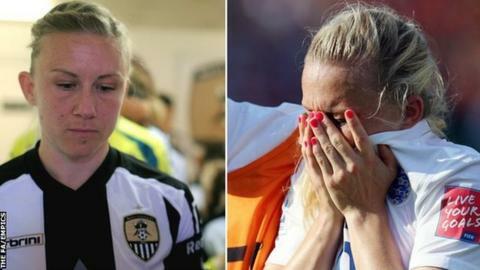 But, having said she would "prefer no-one to know my name" only a month ago, the Notts County captain concedes that becoming the first woman to lift the FA Cup trophy at Wembley on Saturday would be a seminal moment in time. "It would be an iconic picture, but that is not my motivation," the 31-year-old told BBC Sport. "My motivation is to make Notts County Ladies as successful as it can be. "I could not care who lifted the cup. I just want the Notts County name to be etched in that trophy." The Wembley final, which the Football Association have confirmed will become a regular fixture, comes just four weeks after Bassett inadvertently deflected the ball into England's net against Japan, seeing the nation's hopes of a first Women's World Cup triumph end at the semi-final stage. The tears that followed have dried, but the moment is still "raw". It is in the East Midlands, on the training pitches at Nottingham Trent University, that Bassett feels most at ease away from the swirl of interest that has followed her from Canada. She sits on the 3G pitch talking with excitement about possible 32nd-birthday celebrations the day after the FA Cup final. With so much to look forward to Bassett has no need to dwell on the World Cup. And yet it remains part of her - even through the bronze-medal-winning World Cup smile that she and the England Lionesses made history to earn. "It was so special," said Bassett. "There was the good, the bad and the downright ugly that happened over there and those things, especially the ugly bit, will stay with me. "I would have preferred the moment to have been lifting the World Cup. Not for me, but for Steph Houghton, for the team, for Mark Sampson to lift the World Cup. "For me, that would have been the ultimate. For me there is only one real iconic moment that there could be." It is the black and white stripes of a the Football League's oldest club, playing for a side trailblazing the way for the women's game at Wembley, that Bassett now gets her chance to lift a trophy. But typical of the two-time FA Cup winner - who led Birmingham City to their first major piece of silverware when they won the competition in 2012 - she is only too eager to deflect attention away from herself. "It is a chance for us to create history and to get Notts County as a brand and as a name on the map," said Bassett. "Me, myself and everyone that is attached to this club is just looking forward to that day. I just know the good people that we have got, the good characters, will be doing anything and everything in our power to make it a historic day." For someone who has been at Meadow Lane for less than seven months, Bassett talks with intense pride and sense of obligation to Notts County, a club which appointed her captain on her arrival and embraced her on her return from Canada. "I couldn't do anything or give anything else because I don't want to let them down," she said. "I know they will stand by me if maybe I'm struggling to deal with things. I know they will recognise that, appreciate it and help me through it. "I wouldn't want to be at any other club or with any other group of people to get through this. "With the passion, motivation and ambition that the people here have and how hard they work, we really have a bright future." Bassett's focus on the club, team-mates and not wanting to let anyone down is what Notts County goalkeeper Carly Telford has come to expect of her England team-mate. Telford was Bassett's room-mate in Canada, she knows how her friend was affected and is astounded by how England has reacted. "We all want to do it for her," said Telford. "What better way to go out after what happened. She got a bronze medal so let's try get her some gold. "I think she will be really surprised by how many people she has inspired, how many people she has made proud, people that now want to support Bass or see Bass do well. "It was heartbreaking for so many people and for people who didn't even know who Laura Bassett was until that moment. And now she has got this support behind her that nobody would ever have imagined or dreamed that she could have had. "So many people will be wanting her to lift that trophy. I know Bass so well that she will want to do it for everyone else other than herself. It is never about her, never about what she wants."